This is a made to order item and ships within 8 weeks. Please allow up to 1 additional week transit time for your item to arrive. 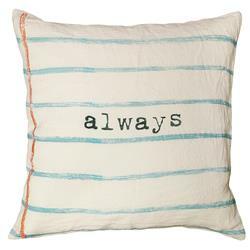 Designed by a husband and wife team, our luxurious down filled pillows are inspired by the ones we love. Motifs comes from family, nature, animals, old things, children's art and folk art. All throw pillows are made with love here in the Blue Ridge Mountains of North Georgia.